Whimsical cartoon greeting cards for every occasion! New Baby Card: He's / She's Here! 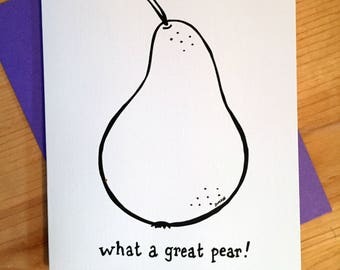 Wedding/Engagement Card: "What a Great Pear"
Design was great. Delivered very quickly. Fast delivery and looks like the photo. Liked the choice of envelope color. Also, where else but Etsy would one find a dinosaur wedding card for a dinosaur loving couple?! All of these cards began as cartoons to amuse family and friends on holidays. People often ask me how I come up with the ideas for these cartoons. I tell them: I think about being in a snowstorm.. as an octopus. It’s that intersection of disconnected ideas that tends to spark my imagination. When I develop the concept into a cartoon, I like to allow my readers to fill in some of the blanks rather than slapping them in the face with a punch line. This connect-the-dots tactic allows the reader to co-create the story with me. Sometimes, my comics are understood differently (and often more cleverly) than I had originally intended. I like that. Over the years, people have asked for these cartoons in greeting card form, and voila! Welcome to my Etsy shop. In addition to the cards in my shop, I am happy to do commissioned pieces-- just get in touch and let me know what you have in mind! Jennifer DiMase Comstock is a multi-tasker. A designer. A cartoonist. A baker. A list writer. She is driven by curiosity about how things come to be, inspired by good design, and passionate about people.